Shirts With Random Triangles: SEC Championship Game will remain in Atlanta through 2027, will move to new Mercedes-Benz Stadium. SEC Championship Game will remain in Atlanta through 2027, will move to new Mercedes-Benz Stadium. 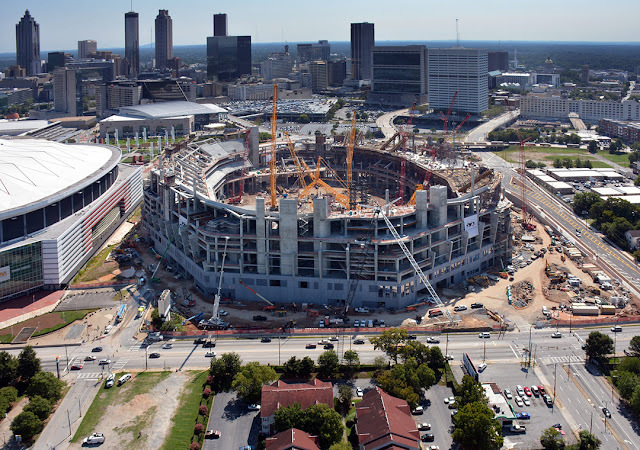 Under-construction Mercedes-Benz Stadium in Atlanta. Img. via mercedesbenzstadium.com. The least shocking news of the day comes from Atlanta, where the long-time home of the SEC Championship Game will continue to host the event through 2027, albeit in a new building in 2017. Multiple sources have reported that the SEC and the Atlanta Falcons have come to an agreement to move the conference's title game from the Georgia Dome to the Falcons' new home, Mercedes-Benz Stadium, when the building opens in 2017. The move was expected as the Georgia Dome is expected to be demolished following the Falcons move to its new $1.4 billion dollar home. Atlanta has hosted the SEC Championship Game since 1994, when it moved to the Georgia Dome from Legion Field in Birmingham, Al. The new stadium features a retractable-roof, which means the game could be played in open air for the first time since 1993. The official announcement of the move is expected to be made on Tuesday.